If you have decided to start going to the gym, it's better to know the basics of a good routine. Initially it's important to become familiar with the exercises and perform them properly. When you start at the gym, several questions come to mind about what to do and how. It’s normal to be a little lost when you start a new physical activity. That’s why this article will show you a complete gym routine for beginners. This way you will know what exercises to do and what machines to use. Keep on reading! A gym is a place where you seek to improve your physical performance, as well as losing weight, building muscle or becoming stronger. Besides, it’s usually fun and easily accessible. Normally when you start at the gym your physical capacity is at its best, it’s not always this way, but in most cases it is. This is why beginner’s routines are usually gentle and less demanding than the rest. Surely you’re asking yourself why you can’t start with any type of routine? The answer is easy: you need to give your body some time to get into shape and increase your performance. Having said this, it’s better to start with a beginners gym routine! As a beginner there are certain details you need to know before you begin. Not keeping these in mind could lead to injuries or bad experiences. When you perform any physical activity you burn energy. Therefore it’s essential to consume foods and liquids that will act as fuel during the fat burning process. Besides hydration and good nutrition, warming up is a very important factor. We should not mistake warming up with stretching out, in other words, it must be dynamic and energetic. The purpose of warming up is to prepare your muscles for intense exercises. It’s essential that you warm up before you start any routine. In fact, if you start working out without warming up you take the risk of hurting yourself and affecting your performance. Once you have warmed up and have properly hydrated it is time to get into action. In the beginning, it’s best to avoid certain machines that have a higher difficulty and risk level. At this time, you will not use many machines in your workout routine. It’s also important to point out that it’s ok if you’re not able to finish your whole routine the first time. 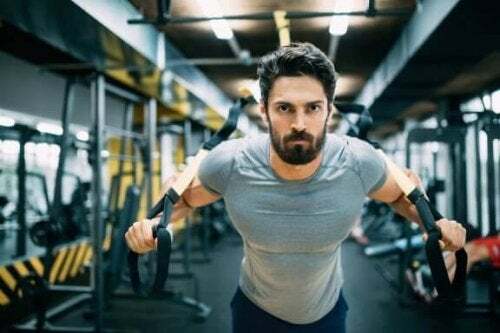 Of course, ideally, you should complete the entire routine; every individual has his own rhythm and you can’t force their endurance in a single workout. There are several exercises you can do without machines, jumping jacks, jogging, skipping or burpees. You should do these for approximately 15 minutes. You can do 3 exercises for 5 minutes each or 2 exercises for 7 minutes each. Cardio machines are extremely simple, so in this part of the routine, you can use one. You can choose from a treadmill or a stationary bicycle. You could also do half of the 15 minutes on a machines and the rest with the already mentioned exercises. Deadlift works on your balance, abdominal area and legs. It is done with a straight bar which you will lift to your waistline. Make sure your back is straight and do not bend your knees beyond your feet. Start with 5 series of 5 repetitions. The abdominals are a set of muscles involved in numerous exercises. This is why it’s recommended to develop this part as much as possible. You can do 4 series of 20 sit ups. If you want to, you may also try laterals, leg lifts, eagle abs, etc..
Push ups, either as a core exercise in your routine or as something extra, will always benefit for your physical condition. It works out your arms, back, abdomen and calves. Do 4 series of 15 repetitions each. As a beginner, you can do them on your knees until you become stronger. Dumbbells are easy to handle and are great to tone and strengthen your muscles. While standing with your back straight, hold a dumbbell in each hand (a weight that you can handle). Place your hands facing outwards and flex your elbows upwards. The dumbbells should reach your shoulder level. Return to the initial position. Do 4 series of 10 repetitions each. Once you finish this last exercise, inhale and exhale slowly. Stretch out for a while to avoid muscle stiffness and to relax. You can do this workout 3 times a week. Do not wait to build your path to success at the gym!